Writing about Stockhausen et al being performed in the redundant Tempelhof Flugplatz in Berlin brought back memories of flying into that most extraordinary of airports. The first time I flew into Berlin was in 1973 and I was fortunate to be the only passenger in an executive jet. 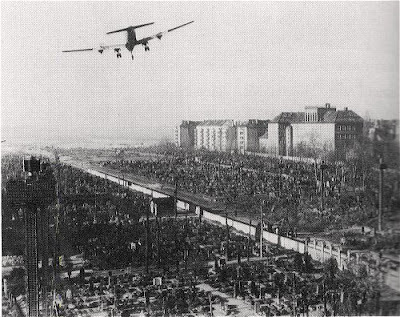 The views approaching Tempelhof was very similar to those seen in the two photos reproduced here. 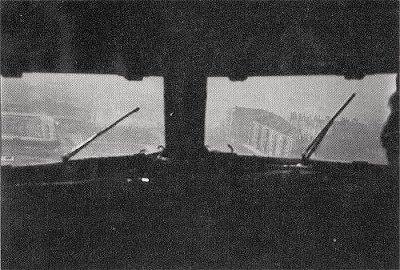 During final approach over the cemetery the plane was at the same height as the apartment blocks on the right, and I remember an early morning flight when eye contact was made with bleary eyed Berliners at their breakfast tables. By a quirk of fate I was in Berlin on 1 September 1975 when British Airways switched its flights to the new Tegel airport in the suburbs. This meant I arrived at Tempelhof and departed from Tegel. The glamour has certainly gone from flying. My first flight into Berlin was by executive jet into Tempelhof. My most recent visit, documented in I am a camera - Berlin, was by unglamorous Ryanair into equally unglamorous Schoenefeld in the former East Berlin. The two photos are from the US National Archives and are reproduced in the newly published The Candy Bombers - The Untold Story of the Berlin Airlift and America's Finest Hour by US political commentator Andrei Cherny. It's a light read, but is most notable for its breathtakingly one-sided view of the Second World War and the years after. The title says it all. Great to know America won the war single-handed then saved Berlin from the Soviets. Shame that little ol' Britain and the other countries that also opposed fascism and then communism are hardly mentioned. An exclusive photo from Cold War Berlin on the path here. The Candy Bombers was published in 2008 and runs to 624 pages. 'Two years after the end of the war, the broadly held conviction that the United States' occupation of defeated Germany would be brief had been quickly discarded'. I see that the author, Andrei Cherny was the youngest White House speechwriter in American history. In 2000 he was the lead negotiator and chief drafter of the national Democratic Party platform and was a senior speechwriter for Vice President Al Gore. His gives his occupation as 'criminal prosector' and is an officer in the US Navy Reserve. A timely reminder that certain attitudes are not exclusive to the Republican party.